Farmhouse and Glitter, is that a combo style or what…lol! I don’t mean I am putting those two styles together, don’t worry. This year I decided to sell ornaments for the holidays. I have two styles and I bet you just guessed what they are. Some ornaments are farmhouse inspired and some ornaments are bold glitter. 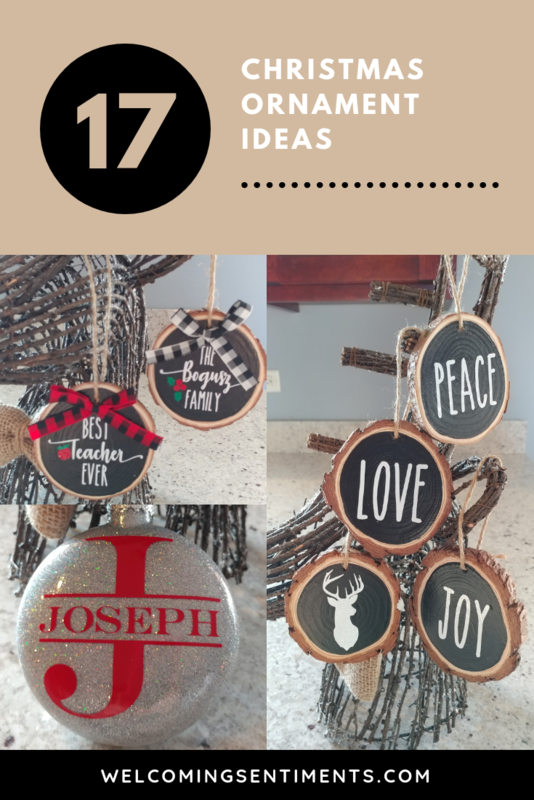 The farmhouse inspired wood slice ornaments are roughly a 3.5 inch circle. It’s wood so none are exactly alike. Change teacher to boss, doctor, coach etc. These can really be any single word or image. In order to fit best the word should be 7 letters or under. You can see in the picture of BELIEVE that it doesn’t fill the ornament as much as shorter words. You can do first names of the family for these too. The glitter ornaments are the 4 inch glass disk ornaments. I am not going to put these on Etsy so that I can keep the price a little lower and not have to build in the Etsy fees into the price. I can do local delivery for those that know me and will be at my parents for Thanksgiving for anyone local to them. For anyone not local to either of those options we can chat about shipping. The images posted are just ideas, anything can be customized. I even have this example that I dropped and broke! UGH, I was so mad at myself but here’s the picture anyway just so you can see another example. Do not miss the chance for a free e-book that will help you identify the keys to having a healthy home.